Going Away Party for Jon & Jenn D! If you didn’t already know, Jon & Jenn are moving soon to Houston. We are very sad to see them leave but also know they have an exciting future ahead of them! We would like to throw them a going away party next Friday, May 1, at Legends at 6:30pm. Bring your family for dinner or just stop by for dessert and say goodbye. We will provide a cake for dessert. We hope to see everyone there! 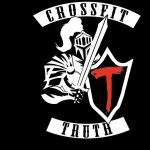 Come show Jon & Jenn how much we appreciate them at CrossFt Truth! This Friday, March 27th, we are going to have an end of the 2015 CrossFit Opens party!!! We will run Open WOD 15.5 in heats and after everyone has gone we will EAT together!!! We will provide the meat which will be hamburgers and hotdogs and I will post a sign-up sheet for sides, condiments, dessert, drinks, plates, etc. at the gym. Plan to be there, it will be a fun evening to wrap up the 2015 Open! Look for the sign-up sheet in class tomorrow! EVERYONE is welcome, even if you aren’t signed up for the Open!! See y’all there!! If you were successful last week add 5-10lbs, if not back off to a weight you think you can do for 20 reps.
Outside sprint work/ power cleans. Truth doesn’t need you, you need Truth. Truth inspires action, if you believe something it will change your behavior. Relationships require work, they are never neutral. If you want to walk closer to God, enhance your marriage or connect with your kids, learn how to grow those relationships. Truth doesn’t care if you think it is right or wrong. You can’t change truth to fit your lifestyle, your life must be changed to accept truth. Most of us are unwilling to face the truth that would allow us to change. Truth doesn’t need to prove it’s right. Let your actions speak for themselves, people will notice you are different.